The Chihuahua is believed to have originated in the biggest state in Mexico called Chihuahua. Many believe that the chihuahua’s ancestors were an ancient Mexican civilization known as the Toltec. This civilization named the breed Techichi. The breed flourished after the Toltec were conquered by the Aztecs. Graves found by archeologists often had dogs in the ancient graves. The breed disappeared after 1520 when Hernando Cortes conquered Mexico. The breed as we know today is believed to have originated around 1800. It became a recognized breed by the American Kennel Club in 1904. There are two varieties of Chihuahuas, the long coat and the short coat. As there is much speculation as to the history of the Chihuahua, one theory is that the long coat Chihuahua was actually created in the States by breeding a short hair Chihuahua to another toy breed such as the Papillon or Pomeranian. 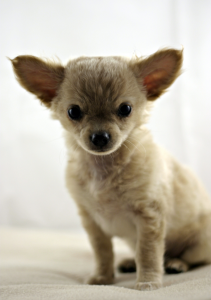 Common colours for a Chihuahua can include fawn, red, cream, silver, white, chocolate, blue and black. The average Chihuahua stands 6 to 10 inches, although some can grow up to 12 to 15 inches. They weigh no more than 3 kilograms and have a life expectancy of 10 to 15 years. They are considered to be the smallest breed in the world. 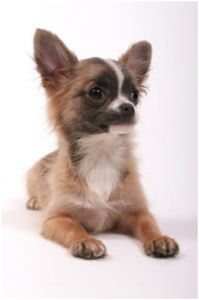 The long haired Chihuahua’s fur is smooth and fine and can take up to two years to fully grow in. Even though their hair is long they shed less than their short hair counterparts. Although the chihuahua appears small in stature they are a very muscular dog. Their skulls are round shape, they have big eyes and huge ears and their muzzle is slightly pointed and short. The Chihuahua is an alert, happy and active dog that can be very devoted and loyal to their master. They can become a one person dog which may lead to being overly jealous which can become a problem. For such a small dog they are very courageous and they are unusually intelligent. Their small size and their curious nature make them adaptable to many environments. They can adapt to city life quite well. Often believed to be a high strung dog with proper training the Chihuahua can be an outstanding companion. Chihuahuas’ are susceptible to various neurological defects which include epilepsy and seizures. Another common ailment among the toy breeds is patchy skull platelets instead of a solid bone. Dogs suffering from this are often slow growing and lethargic. Chihuahuas can also suffer from two types of allergies, internal and external. A Chihuahua can suffer from an internal allergy after ingesting something such as food or medication. The Chihuahua has a very delicate digestive system and it is not uncommon to see them develop some unpleasant reactions to certain types of food. An external allergy can occur after your Chihuahua has come in contact to an outside element such as pollen, dust, shampoos, flea bites etc. These types of allergies can cause many problems for the skin of the Chihuahua. Although the Chihuahua is not a big dog he does have that big dog attitude. He can be a very loving and loyal pet. He may not be big enough to protect you but he will alert to strangers showing no fear the whole time. What a lovely post relating to Chihuahuas. I own one and you are so right when you say that although they may not be big enough to protect you, they are so alert. Ours is a short haired boy and is black. everyone who doesn’t know him would fear him but he is the most loving companion I have ever had. The only issue he has is that when anything moves, he has to bark!!! I think you recommended Secrets To Dog Training could be an informative course and what we need. I look forward to following your blog for future posts. Thanks for your comments Victoria. Chihuahuas are great little dogs. They do tend to gravitate towards one person and I am guessing that would be you! Very interesting and well written article about the Chihuahua! It’s amazing how tiny and cute these dogs are. I am a dog lover myself and it’s always interesting to learn about the different breeds and their characteristics. I have a Schnauzer named Lady. It’s great to have a website like this one that I can go to and learn more about my dog and how to train her properly also! I look forward to learning more doggy training tips that will help improve my dogs behavior. Thanks for your comments Richard. You shouldn’t have any trouble training Lady as Schnauzer are a highly intelligent breed and they are a very active breed.